The SERDI 1.0 Advanced Design was especially developed for the repair of small motorcycle and automotive multivalve cylinder heads. Achieves excellent levels of concentricity even in guide sizes as small as 0.120" / 3mm. This is a high-precision, affordable seat and guide machine. 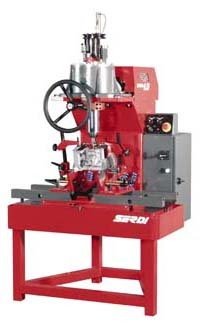 The SERDI 1.0 Advanced Design is the SERDI technology of self-centering on air cushions of a machining motor-spindle for motorcycle and automotive multivalve engines.